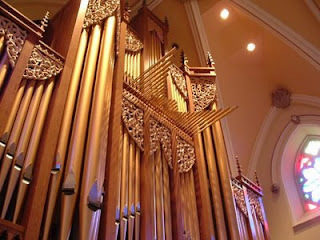 This morning I received an e-mail forum from a good friend and fellow musician where he asked the group to respond to various critiques regarding the purpose and place of elements like instrumentation, style, and technology in churches' corporate worship services. His overall observation had to do with the age-old debate and general disunity that exists among churches' worship music. I think his e-mail can be fairly summarized: "Whether it's a rock song or a Bach concerto, it's my responsibility to worship the Lord with all my heart." The numerous responses are too lengthy to post here, but in summary the issues they tackled were: 1) the distinction between private and corporate worship, 2) music reflecting the culture in which you worship, 3) the issue of worship services looking like a big "rock show" and not much like a worship service, 4) worship leaders being diverse in their musical content, and 5) whether or not we should use some instruments in the worship service that are tied to ungodly purposes or memories of sin. Below was my response. I hope it makes sense out of context. I invite your comments as well. [Our unity in worship] is easier said than done because it really has very little to do with the content of our programs and everything to do with the Holy Spirit breaking pride and selfish motives in our hearts. Thus, the conversation continues- not as a quick fix, but as the Holy Spirit slowly works sanctification in each worshipper's heart. Saxophone? Drums? Electric Guitar? Saying nothing of preferences: “Yes, yes, and yes.” For every vile memory the Enemy has attached to those instruments of death (before knowing Christ), our Redeemer intends to use those same instruments now to cultivate life (since we know Christ). Isaiah 2:4 says, “He shall judge between the nations, and rebuke many people; they shall beat their swords into plowshares, and their spears into pruning hooks; nation shall not lift up sword against nation, neither shall they learn war anymore.” It’s a picture of God turning weapons of war into tools of the harvest (as opposed to simply throwing the sword away in an effort to forget that the war ever happened). If the electric guitar was, in a sense, a sword of the Enemy when you were at war with God, then God’s desire is to turn that “weapon of war into a tool for the harvest”- to see many come to know Him. God has a heart for redemption; He loves to take the standards used by the enemy in our past and to raise them again to new purpose for His Name. So, with that in mind, it seems appropriate not to discard the music that came out of the 70’s, but rather to redeem it for God’ Name. Thanks for including me in this discussion. I look forward to growing in my knowledge of Him through our conversation.